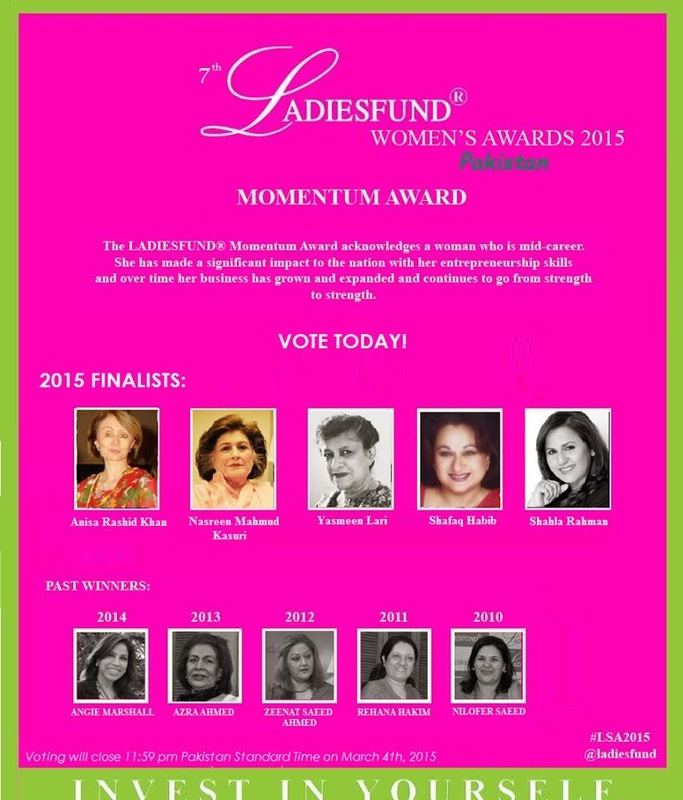 Karachi 26th February, 2015 Dawood Global Foundation officially announced the finalists for the 7th LADIESFUND Women's Awards for Pakistan 2015 to be held at Sindh Governor House on 7th March, 2015 where four hundred of the most dynamic and inspiring women in Pakistan will be in attendance including internationally acclaimed Pakistani women. LADIESFUND was established in 2007 as an initiative to provide financial security to women and to promote and train women entrepreneurs. It aims to integrate the entrepreneurial needs based on the economic and social aspects of the local communities, with respect to greater women participation in the workforce. LADIESFUND Advisory Council members include Amir Adnan, Byram Avari, Dr.Ishrat Husain, Khalid Mirza, Khush Bakht Shujaat, Nasreen Jalil, Shafqat Sultana, Saad Khan, Sultana Siddiqui and Syed Ali Reza. Tara Uzra Dawood, President Dawood Global Foundation, announced, "We are delighted to be holding the 7th LADIESFUND Women's Awards for Pakistan 2015 where we continue to honour the most dynamic and extraordinary women in our country." This year's Chief Guest is Governor Sindh and the Guests of Honour were revealed to be 2015 Lifetime Achievement Winners Noorjehan Bilgrami and Zubeida Mustafa. 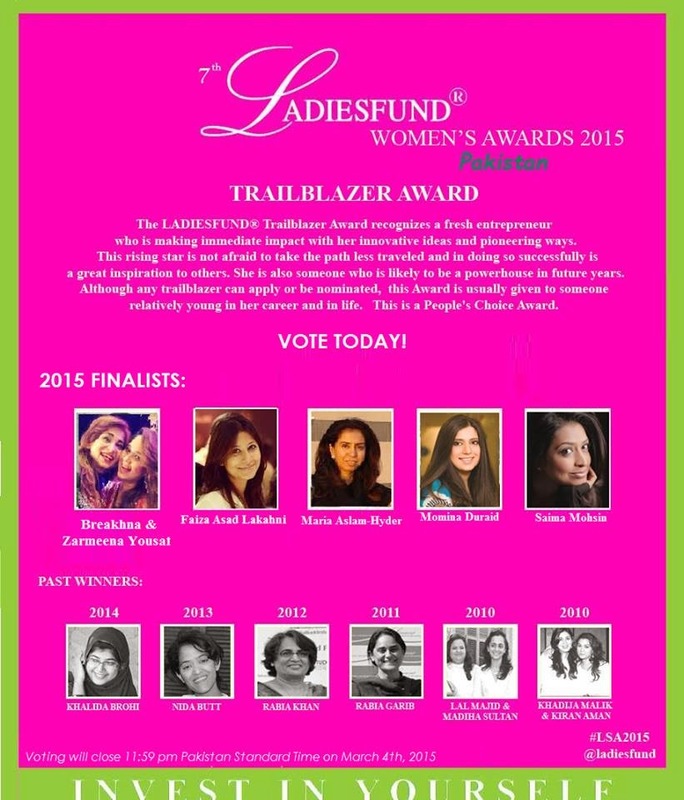 The Trailblazer, Momentum and Woman of the Year are People's Choice, based on top 5 finalists shortlisted by Judges Rehana Hakim (Momentum Winner 2011), Zeenat.S.Ahmed (Momentum Winner 2012), Raheel Tariq Khan (Winner 2008), Rabia Khan (Trailblazer 2012), Shanaz Ramzi (HUM Network) and Tehmina Khaled (Take II). Nominating Chair was Kamyla Marwi of Aman Foundation. Please vote for the winners. Winners will be chosen by YOU, the people of Pakistan, based on on-air and online campaigns by Dawood Global Foundation, LADIESFUND, CityFM89, karachisnob.com and the media of Pakistan. 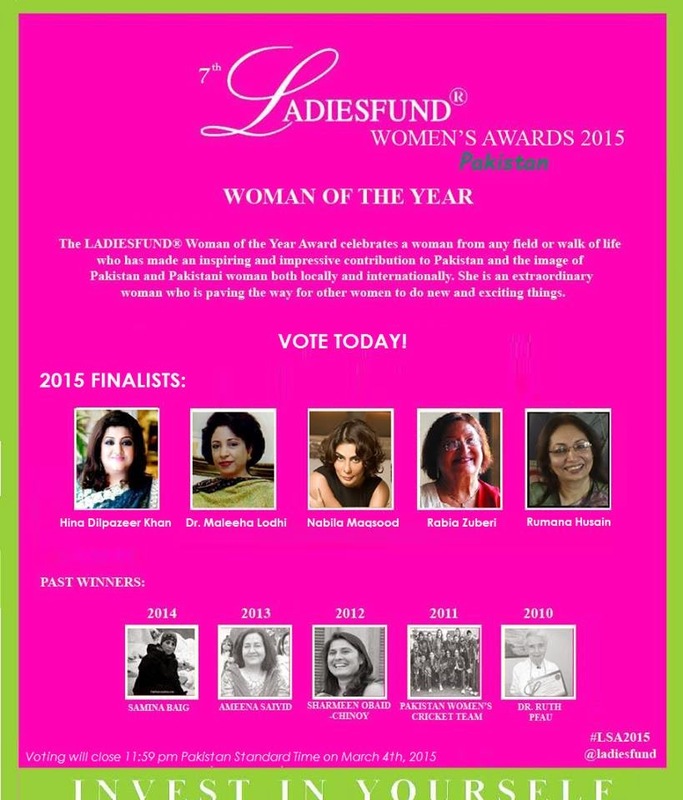 Please vote for winners by clicking on the link below, or on CityFM89, LADIESFUND, Karachi Snob or by emailing at ladiesfund@gmail.com. All winners will receive a piece of silver jewelry by Uzma Javeri, an artisan piece by Artel by Bina Ali, a tikka from Enigma and a Swarovski purse by U&I by Aneesa Unus. Don't forget to vote for the best. I've voted too.